Gov. 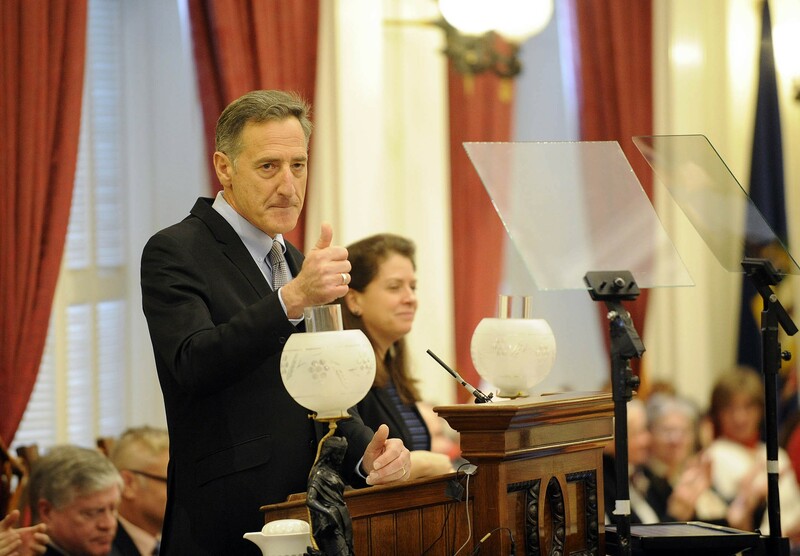 Peter Shumlin gives his final State of the State address Thursday afternoon at the Statehouse in Montpelier. As he delivered his final State of the State address Thursday afternoon, Gov. Peter Shumlin spent a fair bit of the 51- minute speech talking about past successes. But the Democrat, who is retiring next year, offered up two new proposals that can be described as a bit bold. Legalize marijuana, he said, while adding a list of caveats that include ensuring that the state wipes out the drug's black market. And divest state money from fossil fuels, starting with coal and ExxonMobil stocks. Both the marijuana and divestment statements were new nuances for the governor, who is heading into the last of his six years in office. Shumlin announced in June that he will not seek reelection. He had previously hedged on whether to back marijuana legalization this year and dismissed divestment as impractical. Shumlin made no outright mention of his pending departure from office a year from now, but the reality was ever-present. Looking to his post-office future, Shumlin made a point of introducing his new wife, Katie Hunt, who sat in the audience, calling her “my love” and referring to her as “your first lady.” He and Hunt were married December 15 and plan to move back to Windham County after his term ends. Shumlin, who has created a web page recounting his time in office, used his speech to lay claim to successes during his tenure, such as expanding early education opportunities, health coverage and renewable energy. He spoke in a packed House chamber of legislators and invited guests. Shumlin delivered his speech without a hint of the protests that interrupted his inaugural address a year ago after he ditched plans for single-payer health coverage. When he noted that the per-capita income has remained at or above the national average, his staff led the applause. But it was U.S. Sen. Patrick Leahy (D-Vt.) who drew the most enthusiastic applause of the day, when Shumlin thanked him for providing funding to clean up Lake Champlain. Leahy said it was the first time he’d attended one of Shumlin’s addresses, as they have conflicted with Senate sessions in Washington in the past. Shumlin also used the speech to revisit familiar territory. Two years ago, he focused virtually all of his State of the State address on calling for increased treatment of opiate addiction. “We must continue to expand treatment,” he said Thursday. He also reiterated his frustration with the U.S. Food and Drug Administration and drug companies for the proliferation of prescription painkillers, calling for limits. “I am proposing a new system, where a maximum of 10 pills will be the limit for minor procedures,” Shumlin said. In the audience, Dr. Deb Richter, a physician and longtime Shumlin supporter, wasn’t so sure about this idea. She said it’s good to remind doctors to take a look at their prescribing practices, but she disagreed with his plan to "dictate" how many pain pills doctors could prescribe. Shumlin honored the family of Lara Sobel, the Department for Children and Families social worker who was gunned down outside her Barre office in August, allegedly by a client whose child had been taken into custody. “We will never forget your mom,” Shumlin told Sobel’s daughters, Julia and Elahna, and husband, Tim, as they sat in the balcony of the House chamber. Shumlin reiterated plans to add 35 social workers to help ease a rising caseload fueled by drug-addicted parents. 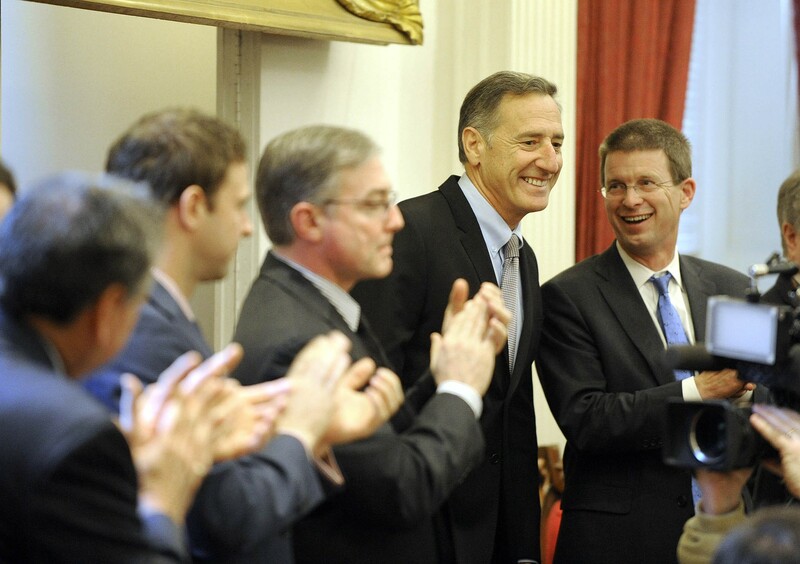 Shumlin backed passage of a bill that would require employers to provide paid sick leave. The legislation passed the House last year and is awaiting action in the Senate. Calling for expansion of a Vermont Enterprise Fund created last year, Shumlin announced the fund helped draw BHS Composites of Sherbrooke, Québec, to St. Johnsbury, where it is expected to create 75 manufacturing jobs. He brought in Vermonters who illustrate other policy proposals he was presenting to the legislature for approval. Asking for $2 million to launch a Step Up Program to provide a free semester of college to low-income students, Shumlin gave a nod to Brandin and Justin Bourdeau, products of a similar program in Morrisville. As he did last month, Shumlin again called on lawmakers to repeal or delay a school spending cap before school budgets go to vote in March. That's unlikely to happen, House leaders indicated. "I don't think repeal is on the table," said House Education Committee chair David Sharpe ( D-Bristol). Gov. 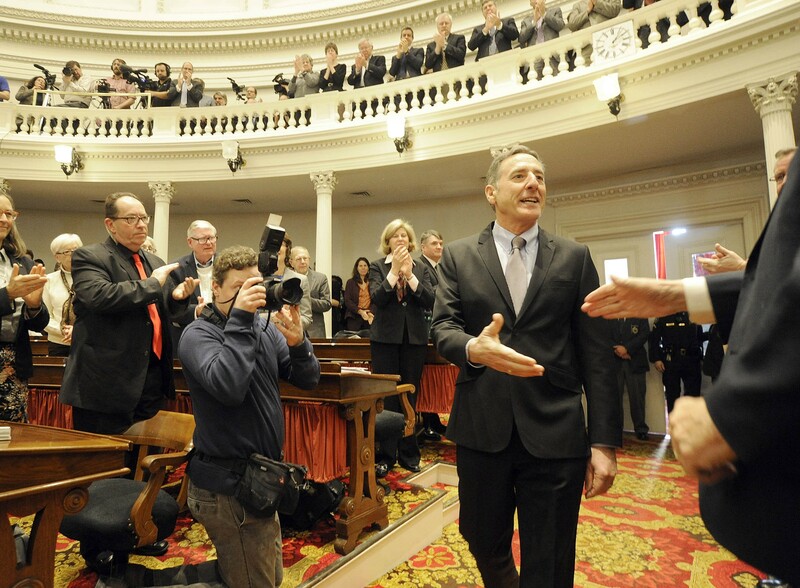 Peter Shumlin arrives for his State of the State address Thursday. But it was marijuana and fossil-fuel divestment that stood out the most in Shumlin’s speech. Shumlin asked legislators to follow California in divesting from coal assets, while joining a study of divestment from oil companies. In the meantime, Shumlin said, the state should ditch any Exxon-Mobil stock. “Owning ExxonMobil stock is not a business Vermont should be in,” he said, arguing that the company chose to conceal information about global warming from the public, just as tobacco companies once chose to hide the health risks of their product. Environmental activist Bill McKibben of Ripton was in the audience as Shumlin’s guest. He noted that many people have divested from coal, but the governor's call to divest from ExxonMobil "is really groundbreaking." It was near the end of his speech when Shumlin turned to marijuana. He'd been hedging on whether he would push for passage in 2016. Thursday he indicated he thinks the state can do it, but called for a "sensible, cautious bill." “I believe we have the capacity to take this next step and get marijuana legalization done right," Shumlin said. Rep. Chris Pearson (P-Burlington), author of a marijuana legalization bill, praised Shumlin's statement. "I think he has the right approach," Pearson said. House Democrats remain lukewarm about marijuana legalization, though. "There is not broad consensus about which way to go," House majority leader Sarah Copeland Hanzas (D-Bradford) said. Senate Republican minority leader Joe Benning (R-Caledonia) and House Republican minority leader Don Turner (R-Milton) both criticized the governor for proposing new programs when the state has trouble paying for the services it already offers. Republican Lt. Gov. Phil Scott, who hopes to succeed Shumlin in the governor's office, plans a live, online response to the speech at 7:30 p.m. Thursday.